City in Upper Franconia, Bavaria. As early as the beginning of the eleventh century Jews had settled at Bamberg. In the second half of the twelfth century Benjamin of Tudela, at the end of his "Travels," mentions its large congregation, which included many scholars and rich men. In 1096 Emicho of Leiningen instigated a massacre among the Jews; in 1218 two Jews were martyred; and in 1298 the Jews suffered terribly at the hands of Rindfleisch and his bands, one hundred and thirty-five of them being murdered. They were persecuted so atrociously at the time of the Black Death, in 1349, that they set fire to their own houses and sought death in the flames. The prince-bishop then took possession of such of their houses as were left, and also of the synagogue. Bishop Anton protected them because a rich Jew of Bamberg lent him large sums of money. They were expelled in 1442, but returned in 1453. In 1451 Johann von Capistrano, the "Scourge of the Hebrews," preached against the Jews in the cathedral of Bamberg. They were forced to listen to the mission sermons of a Dominican monk, and, as they steadfastly refused to be converted, they were once more expelled in 1478. Within twenty-five years, however, they had again returned to Bamberg. In the sixteenth century they were often threatened with expulsion. During the Thirty Years' war they, together with their fellow-citizens, suffered at the hands of the Swedes. Better days came with the second half of the seventeenth century. In 1683 they prevented an expulsion by sacrificing large sums of money. During a commercial crisis in 1699 the populace rose up against the Jews, and one Jew saved himself by throwing prunes from a gable-window down upon the mob. That event, the 29th of Nisan, called "Zwetschgen-Ta'anit" (Prune-Fast), is still commemorated by a fast and a Purim festivity. At that time many communities in the vicinity of Bamberg were plundered. Emperor Leopold ordered an investigation of the affair and had the leaders punished. In 1737 the number of Jews permitted to live at Bamberg was fixed at forty-eight, each of whom must possess 2,000 thalers, a sum that was increased in 1747 to 4,000. Not until 1813 was the Jews' matriculation ("Judenmatrikel") substituted for the letter of protection. The first synagogue of the community became the "Marienkirche" after the persecution of 1349, and when it fell into decay in 1470 a new church was built on the site. The second synagogue escaped a similar fate after the expulsion of 1478, being bought by Jacob Kerpf, a Jew of Nuremberg. In 1561 the community rented a rear building for its third place of worship, which was changed into a synagogue in 1679. The fourth synagogue was erected on the same site in 1853. Bamberg at all times had a ghetto. The cemetery was outside of the Sandthor until 1478, having been enlarged in 1407. In the sixteenth century the Jews of Bamberg buried their dead in Zeckendorf, and after the middle of the eighteenth century in Walsdorf; but since 1851 they have had a cemetery of their own. In harmony with the importance of the community the rabbinate was occupied by eminent men. Samuel of Bamberg, well known as halakist, exegete, and piyyuṭ expounder, lived there about 1220. Israel of Bamberg, author of Tosafot (about 1250), succeeded him. Rabbi Feyst is mentioned about 1403. More famous than any of these was David Sprinz (about 1445), who went later to Nuremberg. Moses Minz, the last great representative of Talmudic learning among the German rabbis of the Middle Ages, lived at Bamberg from 1469 to 1474. Rabbi Samuel Meseritz, author of the collection of formulas and documents "Naḥalat Shib'ah" (Amsterdam, 1667-68), was at Bamberg from 1661 to 1665. His successors were: Moses Fürth, 1665-67; Enoch Levi, 1674-78; Mordecai Lipschütz, 1678-85; Mendel Rothschild, 1686-1718; Moses Broda, 1718-33; Nathan Utiz, 1734-42; Joseph Breslau, 1743-52; Abraham Maler, 1752-57; Tewele Scheuer, 1759-67; Judah Katz, 1770-88; Löb Berlin, 1789-94; Uri Feist, 1797-1802; Joseph Gersfeld, 1802-14; Samson Wolf Rosenfeld, Joseph Kobak (b. 1864), and Dr. A. Eckstein (in 1901). 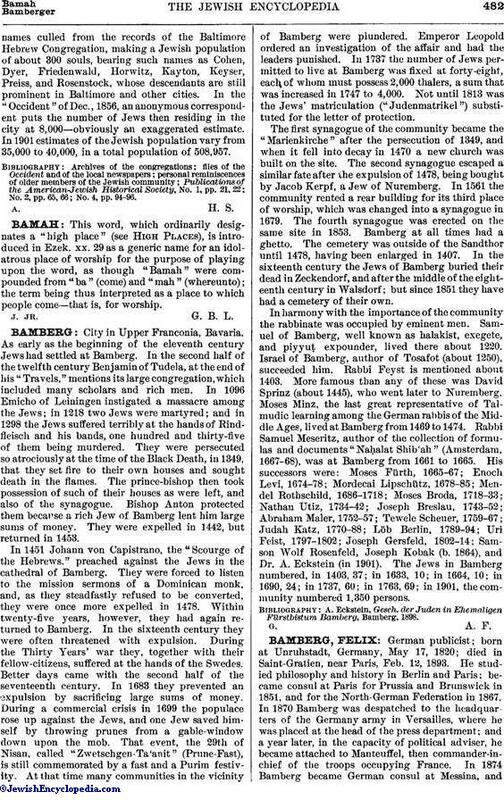 The Jews in Bamberg numbered, in 1403, 37; in 1633, 10; in 1664, 10; in 1690, 24; in 1737, 60; in 1763, 69; in 1901, the community numbered 1,350 persons. A. Eckstein, Gesch. der Juden in Ehemaligen Fürstbistum Bamberg, Bamberg, 1898.